A high criminal court in İstanbul has handed down aggravated life sentences to 41 defendants due to their alleged role in the occupation of the İstanbul Metropolitan Municipality (İBB) building and the killing of 14 people in the incidents there on the night of a failed coup attempt on July 15, 2016. There were a total of 52 defendants in the trial, which was concluded by the İstanbul 26th High Criminal Court on Friday. The military coup attempt claimed the lives of 249 people while a thousand others were injured when a junta within the Turkish military attempted to overthrow the government. The coup attempt was suppressed within several hours. The İBB building was one of the places occupied by the putschists where 14 people including Professor İlhan Varank were killed. Varank was the brother of President Recep Tayyip Erdoğan’s advisor Mustafa Varank. The 41 defendants including former military officers were given aggravated life sentences on charges of attempting to destroy the constitutional order and the murder of 14 individuals. 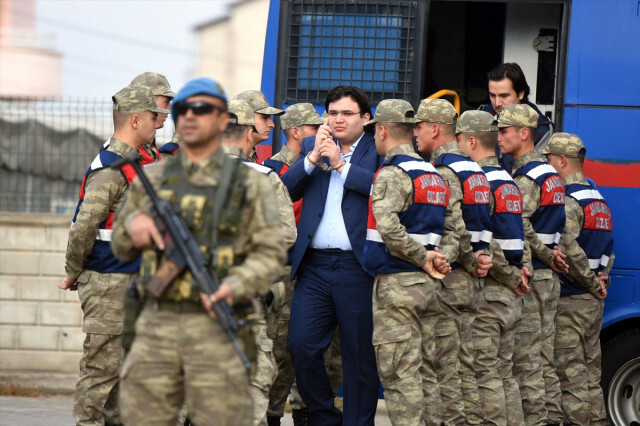 The court ruled for the acquittal of the remaining 11 defendants, all privates, due to a lack of evidence proving their involvement in the coup attempt. İBB Secretary-General Hayri Baraçlı, who spoke to reporters at the end of the hearing, said justice had been served although it was not possible to bring those 14 people back. Last month, the state-run Anadolu news agency reported that a total of 285 cases were launched against coup suspects and 889 verdicts of life imprisonment had been handed down in 137 of those cases up until then. Meanwhile, 1,393 defendants were sentenced to varying jail terms. Apart from coup trials, thousands of others have been convicted of membership in or leading a terrorist group after they were detained over alleged ties to the Gülen movement. The Turkish government accuses the Gülen movement of masterminding the July 15, 2016 failed coup, although the movement denies any involvement. More than 150,000 people have been taken into police custody, of whom 77,000 have been put in pretrial detention.